Then the town ran out of bread – or at least the co-op and local newsagents did. 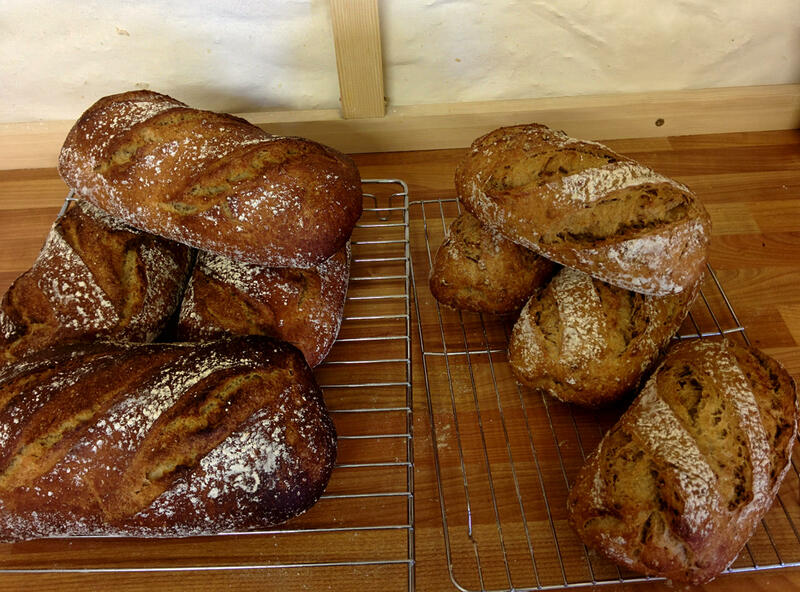 I normally bake mostly sourdough breads for The Seed in Fore Street as well as a few local community shops and so on. On Friday I usually take about 35 loaves down to South Brent to Foggs Deli, however there was absolutely no chance of that happening due to the snow. Fortunately The Seed were only too happy to take them in addition to their own lot, given the worsening weather. By then the co-op and the newsagents had run out of bread too. I offered Pete at Huccaby’s news some regular loaves and he was happy to take some, so the ovens were back on and a batch of some 36 loaves was made for them. Saturday came – and with it an eerie quietness over the town… Nothing was moving at all. 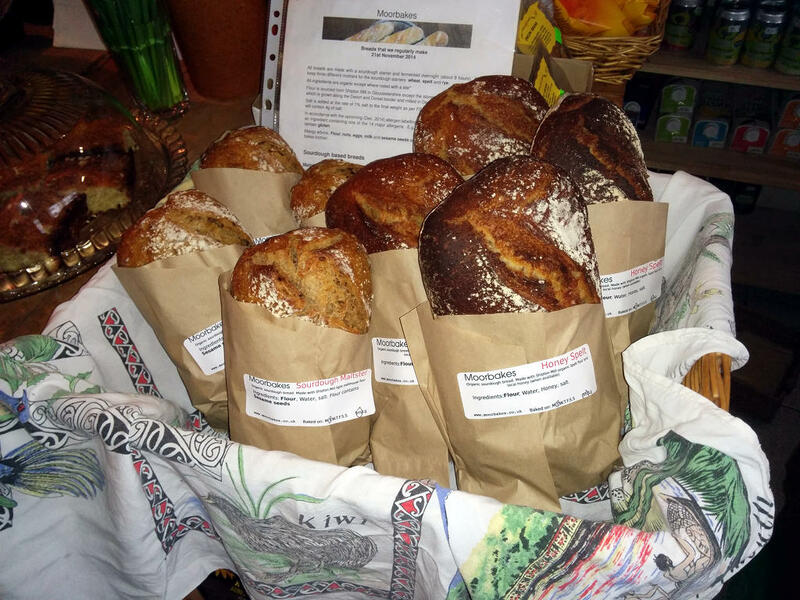 My usual sourdoughs to the Seed plus extra that I’d normally deliver to Holne community shop as well as a few extra standard loaves… And yet another large batch to the newsagents – I think by this time word may have gotten out about them having fresh, warm bread in their shop. Sunday – thaw, but the big delivery companies hadn’t “rebooted” themselves, so the shops were still bare, although the roads were now opening so some milk was available in the shops – and the ovens were on again to get another big batch of standard loaves up to Pete and Angela at Huccabys newsagents. 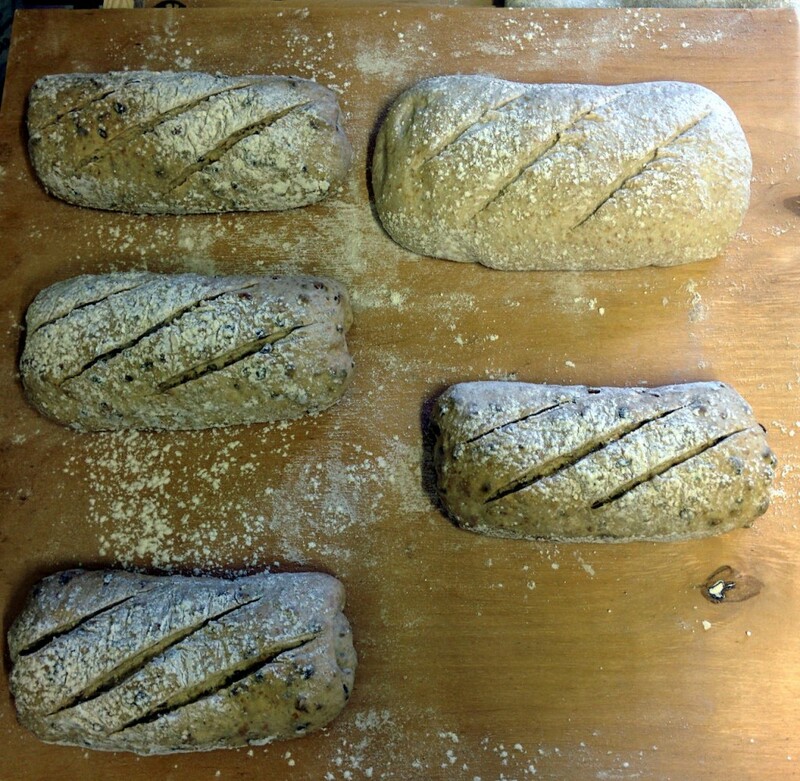 As someone running a home-based microbakery, which really started as a little hobby some 5 years ago, the past few days have been a mixture of challenge and a little excitement – I’m glad that I was able to help in a small way, and provide some of the townsfolks with bread – even if it did need to be sliced at home! I’ve had some nice comments – many thanks to those who’ve taken the time to post to the local social media boards, facebook and so on, and said a cheery “hello” when passing in the street. During the spring and early summer of 2015 my little microbakery started to get a little busy… To the point that I was having to get up earlier to push the bread through my 2 ovens – a domestic 68l Beko fan oven and my relatively new Lincat EC08. 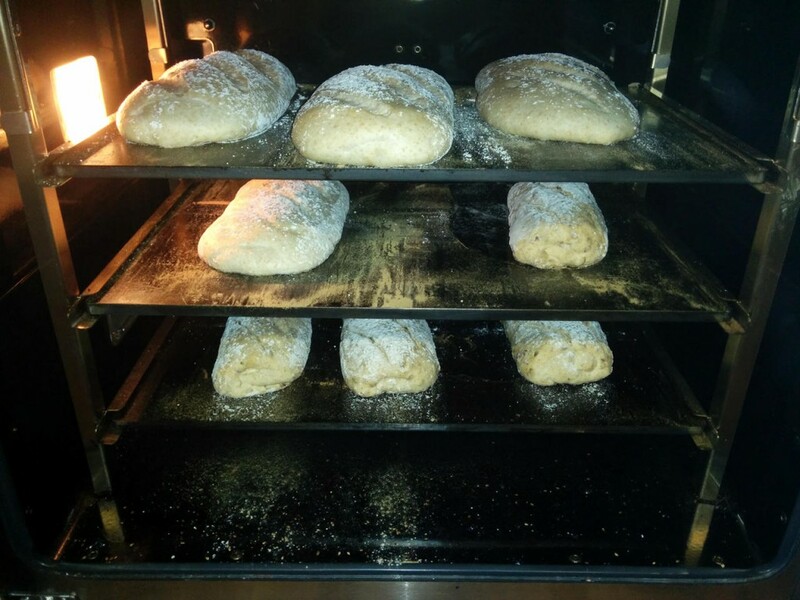 I was regularly up to 2 loads through each oven and it was looking like more… Which would have been OK, but it would have meant getting up earlier and earlier… And as I’m somewhat lazy and my wife was somewhat grumbly about it, something else had to be done, so I started looking at ovens again. Way back I looked at the Rofco ovens and lusted after one, but at that time there was no UK distributor. 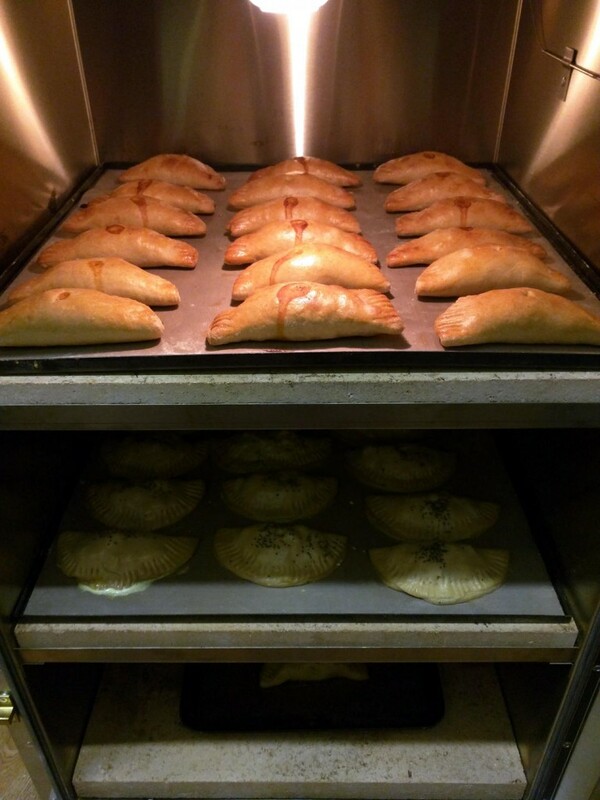 I like having a UK “shop” for things I buy – if nothing else, it’s someone closer to home to complain to, so when I found out that Brook Foods in Somerset were now importing Rofco ovens I had another good look at them. 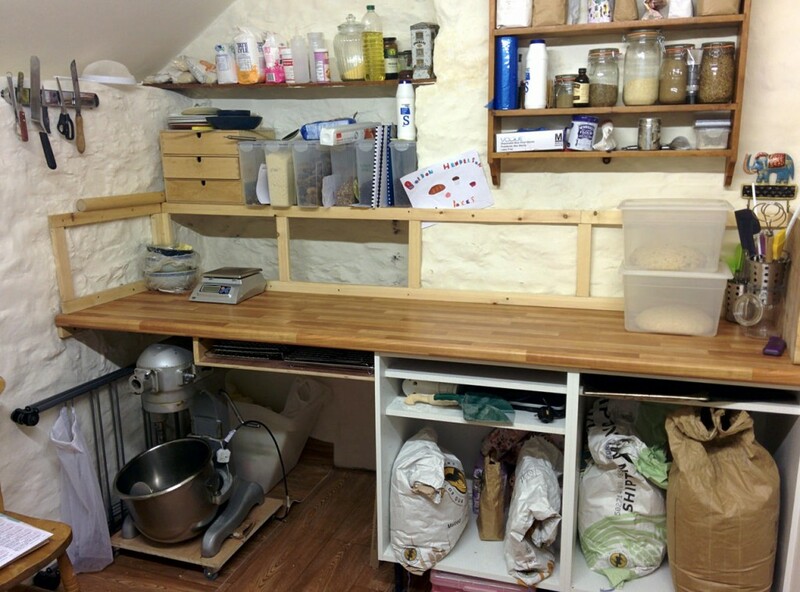 tl;dr – It’s great and I use it every baking day. 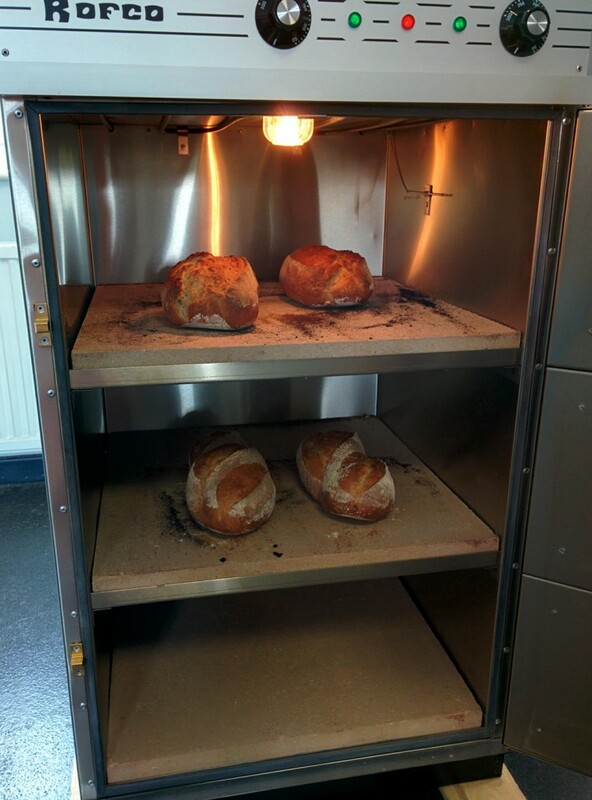 The first commercial oven I bought was the Lincat EC08. 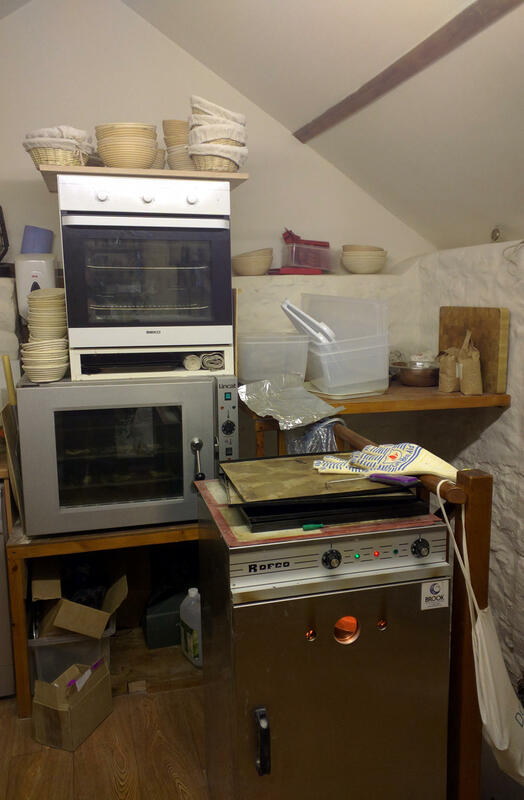 This is a dual fan/heater oven with 3 GN1/1 shelves. It has the luxury of a water inlet with a rather crude but effective water injection system. 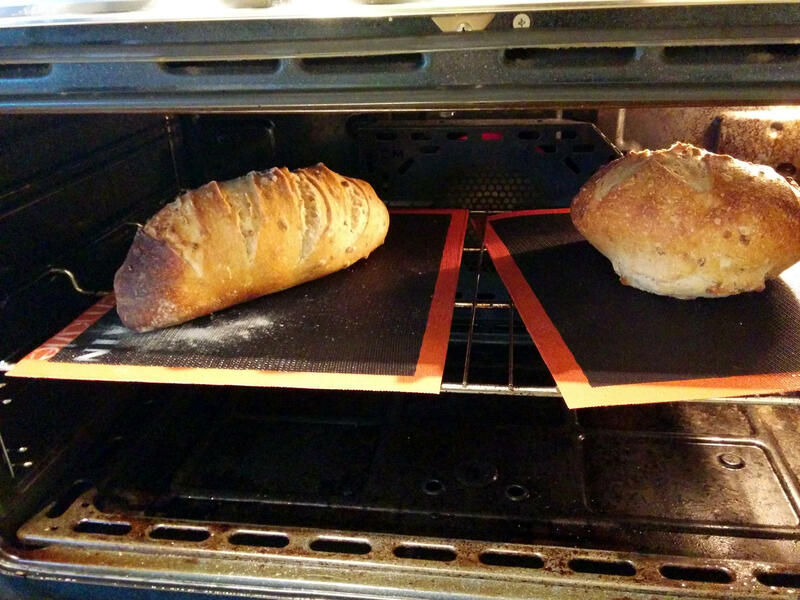 I removed the grids and replaced them with 10mm thick steel plates to simulate a deck oven for bread. This works a treat, but can only bake 6 large or 12 small loaves at a time. So when I needed another oven, another Lincat was the obvious choice, but I was still lusting after a deck oven… The Rofco seemed the only choice in that department, but like other commercial (and semi-commercial) kitchen equipment there were no proper reviews… (I did find a bad review though!) However an email to the Real Bread Campaign mailing list asking for help found someone close enough to me who was willing to spend some time showing me his Rofco, so off to the village post office of Bere Alston I went to meet up with Johnathon, sample some of his wonderful cheese & onion bread and have a chat. 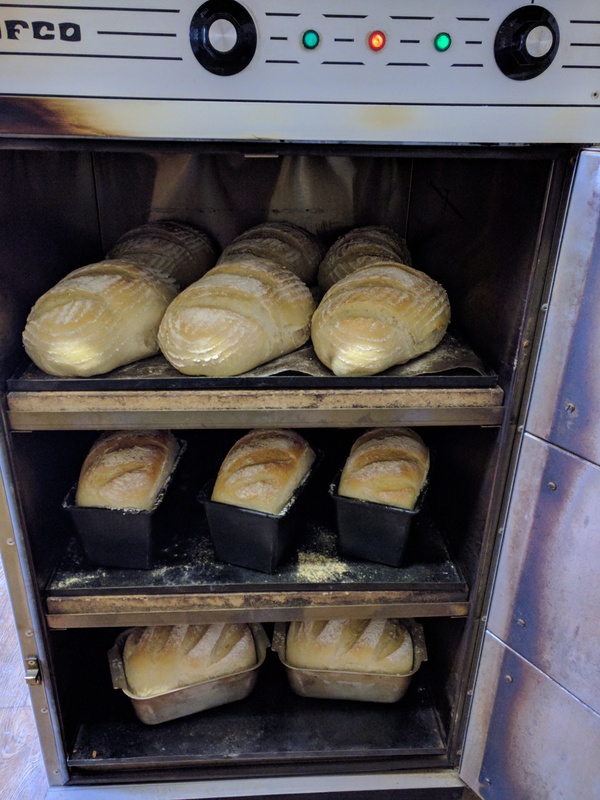 Next up was arranging a trip to Brook Foods to see their demo Rofco and do a trial bake in it – and I’m lucky in that I live relatively close – under 1½ hours away, so early one morning I shaped up 2 sourdough loaves and left them to prove in the car on the drive up. I also took up some standard yeasted mix on its first rise and off I went… I was met by Steve Sanders who made me very welcome and showed me round. 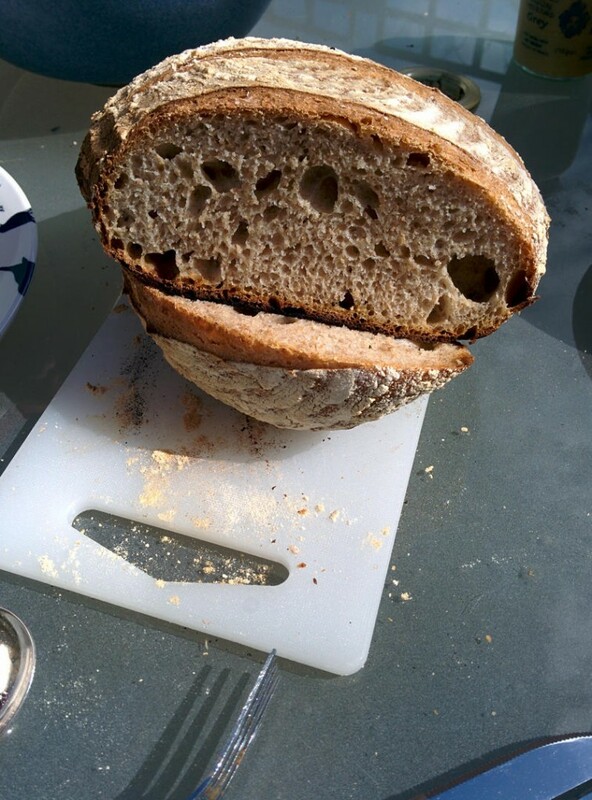 He’d already turned the Rofco on and it was hot, so as soon as I got there, I put the sourdoughs in, and shaped the other lump of dough I’d brought up and leave it to prove. 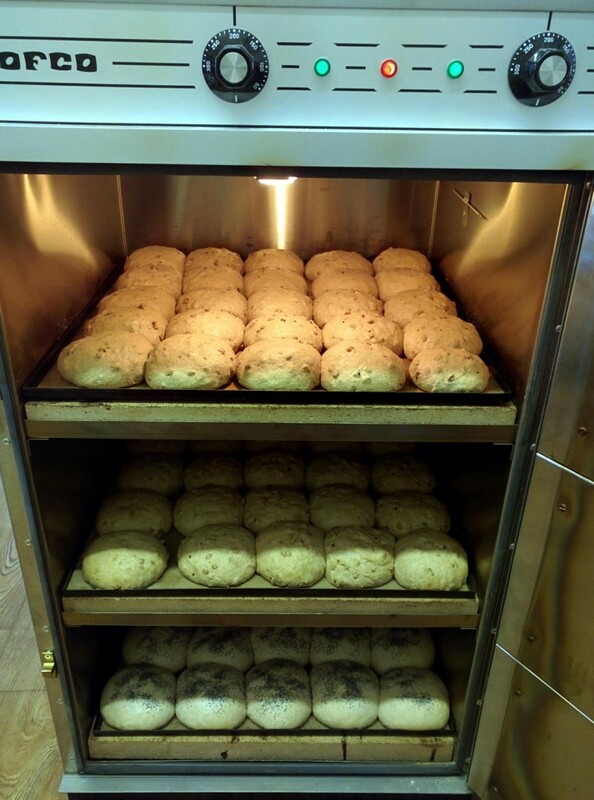 This is the Rofco B40 at Brook Foods with my breads inside it. And so that was that – I signed on the dotted line and took delivery a few days later. Delivery was not without a little mishap, but to their credit, Brook Foods sorted it out on the spot and the next day I was a happy baker. So now… 6 months later… The Rofco has been in-use 5 or 6 days a week with only a brief break in September and over the Christmas period when I had a bit of a break. Not only do I use it for bread, but it now bakes cakes, pastys & empanadas, buns, mince pies and so on. I’ve only had one other issue with it and that’s when I broke the light protector glass – however Brook sent me a replacement inside 48 hours and I’ve been much more careful with the water sprayer since then! Steaming… I opted to not buy the steam pods that Rofco supply – I’d had reports that they take up too much space in the oven and others seem to get by with a pump sprayer thing, so that’s what I use. I spray the rear walls just before closing the door which seems plenty enough for the breads I’m baking. The left dial controls the top and 2nd elements with thermostat T1, the right dial controls the 3rd and 4th elements with thermostat T2. Everything has good and bad points and the Rofco is no exception. Three tall “decks”. No problems with tins for tall loaves. Plenty of space for them to rise and still stay well away from the elements. Two heating controls. (See above) You can cook in either the top deck or all 3 – not the bottom two because the top element in the middle deck (Element 2 above) would not be on. This is fine and I use the top deck on its own for cakes, etc. I can fit 4 cake tins in it and cook 4 at once – for half the electricity load. Nice stainless steel easy clean outside. It’s a deck oven! You can use a peel to get breads in & out. 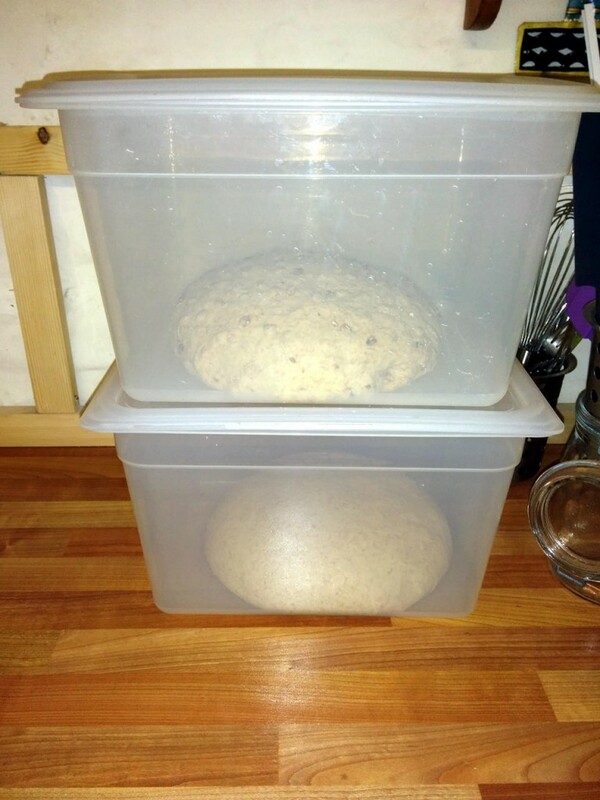 Capacity for 12 large (915g dough) loaves or 18 small loaves, depending on how you shape them. You can get many more in if you use tins – possibly even 8 large tins per deck if you try hard enough. Baking trays – it was supplied with 3 baking trays – simple steel sheets with folded edges – I ordered 3 more (plus their silicone liners) as it’s a very non-standard size. The baking stones can be removed (carefully) as can the door (fiddly). This makes it much easier to move – myself and wife carried it up a set of stairs without too much trouble once we’d removed them. It’s not a standard size. Internal is 480mm x 480mm. This is designed to fit in a standard European kitchen “unit” space (of 600×600) so some trays may not fit well. Getting the hang of the controls took time. I settled on a top temperature of 220°C and a bottom temperature of 210°C. The bottom deck cooks hotter and can scorch the bottoms of your loaves if not careful. It took me about a week of baking to get a setting I was happy with. The middle deck is slightly cooler. Some cakes on one of the supplied baking trays on the top-shelf. These are two 9″/23cm tins and two 8″/20cm tins. 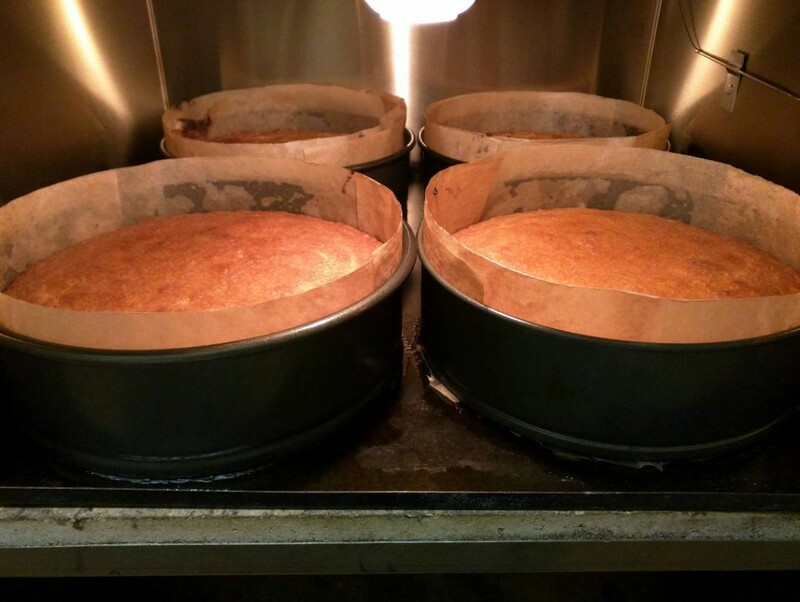 Cakes do tend to brown a bit on-top before they’re finished, so a covering of foil is handy towards the end of baking. It even bakes bread! Those are all around 915g of dough. 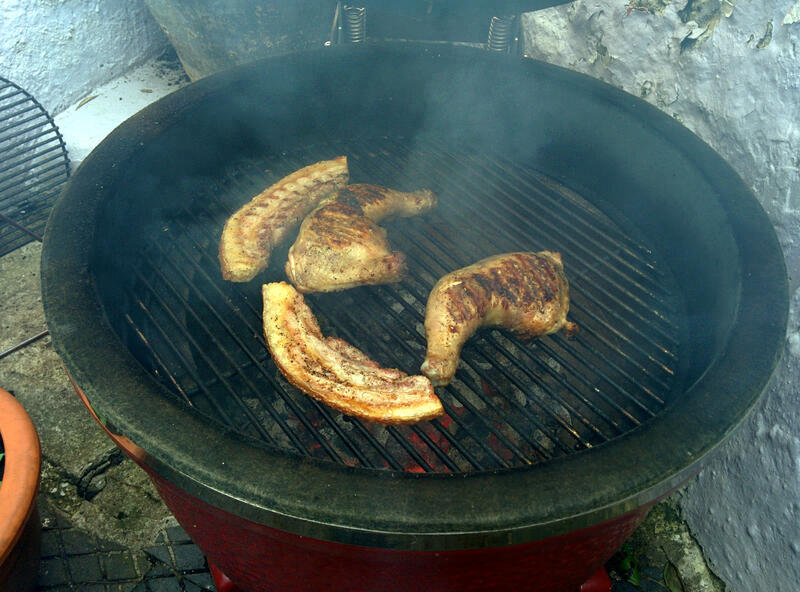 We’ve had a Kamado Joe BBQ for a few years now and use it whenever we can – if it’s not raining (too much) or too windy then it’s the cooker of choice. 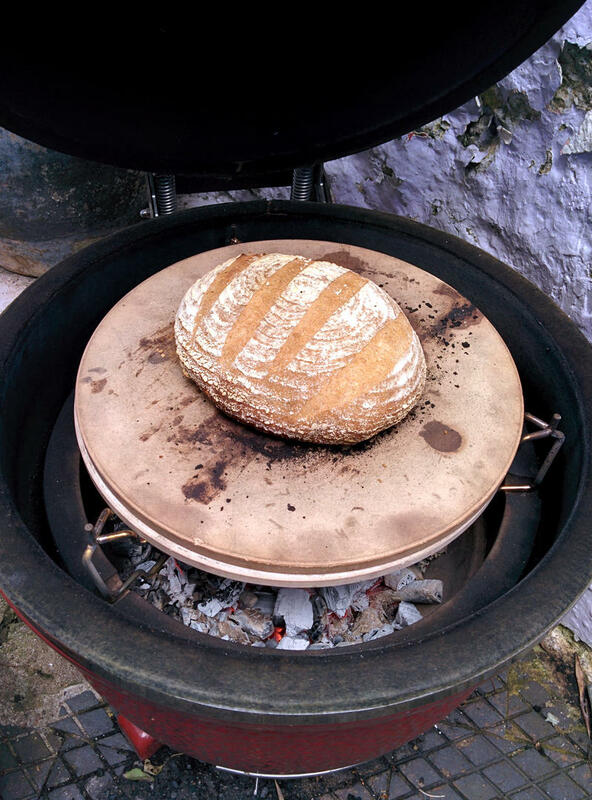 I’ve made bread and pizzas in it a few times now, but felt the heat deflector and pizza stone hadn’t been getting enough use recently so made up some sourdough. Anyway, made the dough and left it to ferment and a few hours later I shaped it and put it into a banneton – and left it to prove. I’ve thrown some flour and semolina over the top in preparation for tipping it out directly onto the stone in the Kamado Joe. The internal temperature at this point was a shade over 300C and the top of the pizza stone (measured using an IR thermometer) was about 210C. 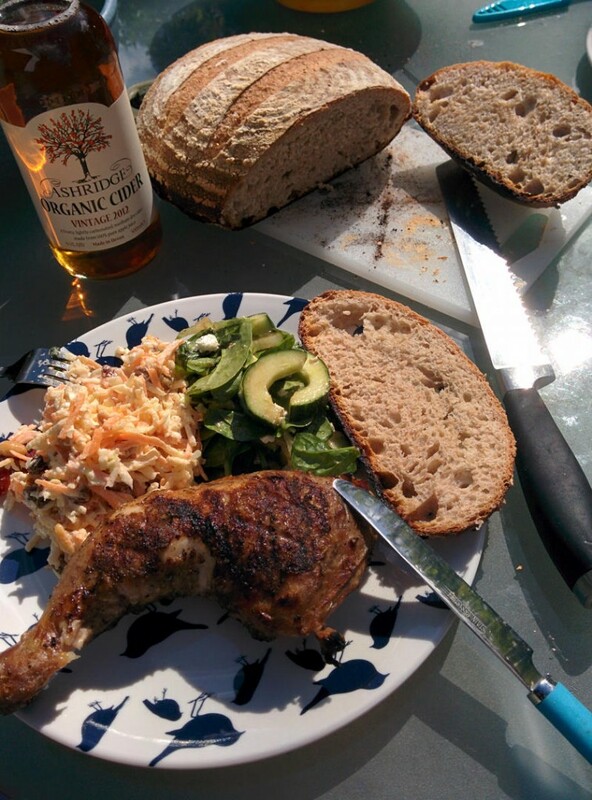 The slightly scorched base wasn’t excessive – didn’t stop it smelling good! A lot of smoke there – maybe it was a bit too hot… Nice crispy skin on the chicken legs and the pork rind though! I can tell its going to be a good summer already! Our local farm shop at Dean Court has been taken over by a farming couple we know and The Outdoor Gourmet next door to it is always helpful and now has locally sourced lumpwood charcoal too! 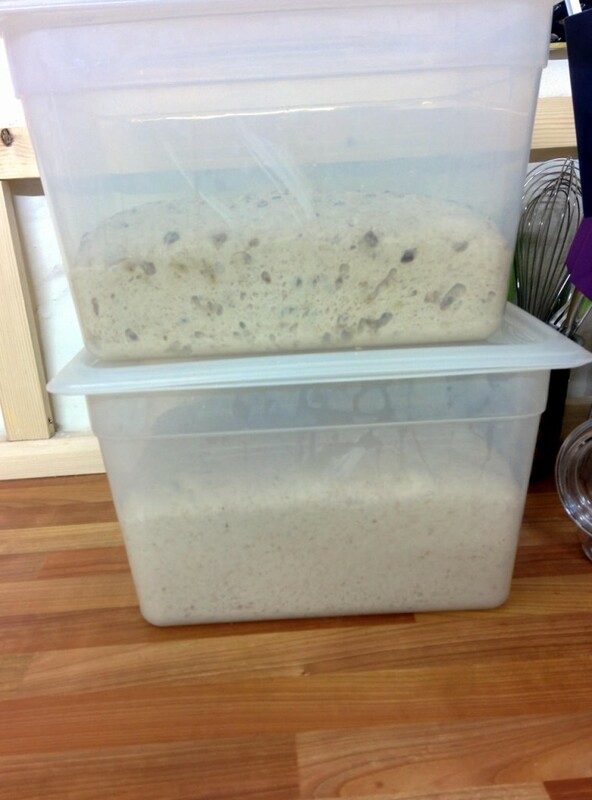 Here’s the tubs of dough. As you can see they’re well risen and ready to go. 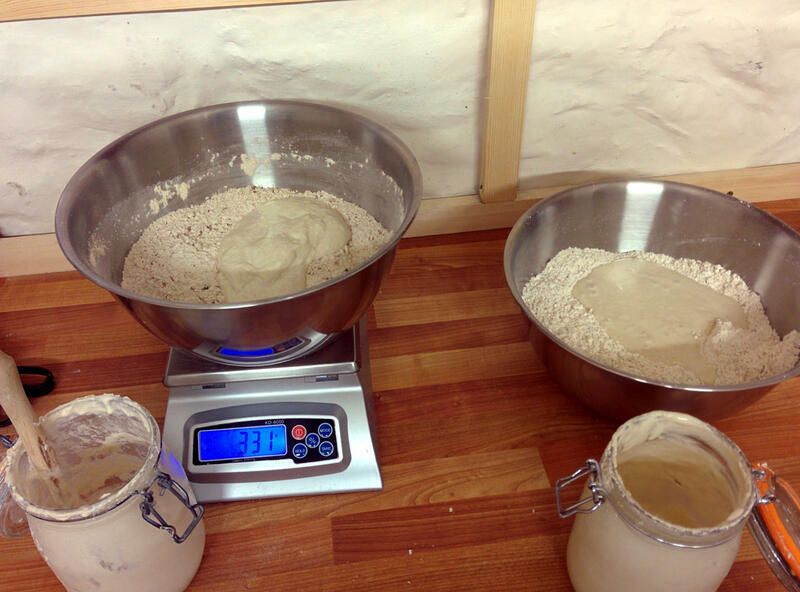 Nothing really special here – I put the tub on the scales, zero the scales then tip out the dough. Put the empty tub back on the scales (which weight negative!) and divide the number by 4 to get the weight of each loaf… Divide the dough into those 4 lumps, then roughly shape into a boulle. 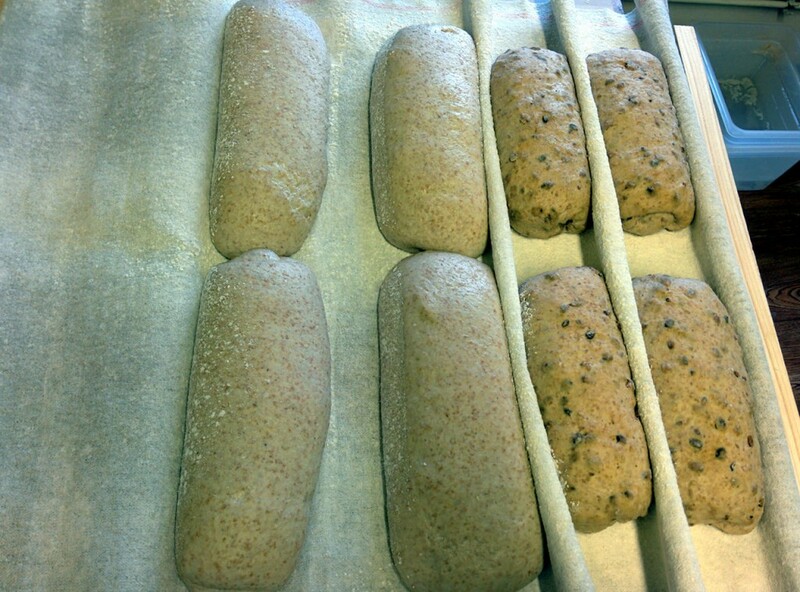 I’ve re-shaped them and transferred them to the couche. My shaping is a 2-step process and one day I might even video it, but there’s a quick 2-turn roll, then a stretch and fold in thirds followed by another roll… It needs a video! The couche is covered by the spare linen, the oven it turned on to heat up to 250C, and it’s left to prove while I have breakfast, shower, etc. Almost there now. 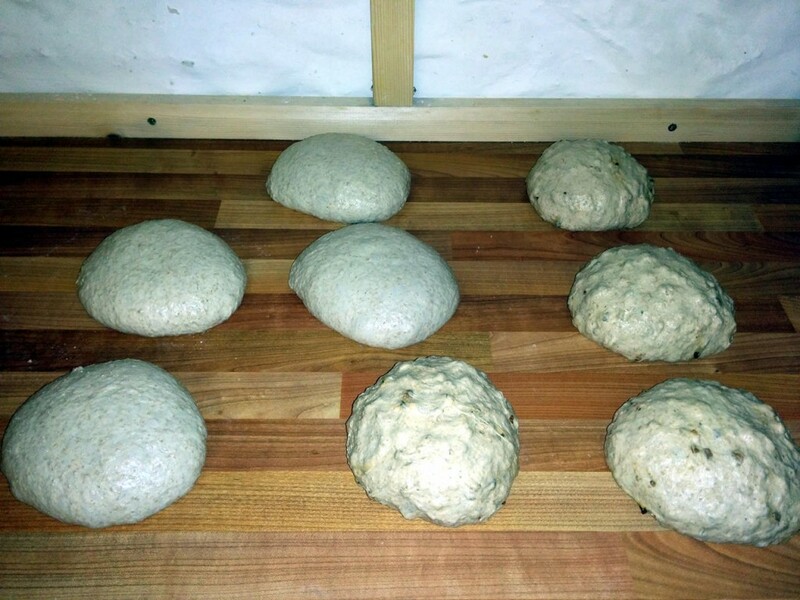 The spelts have risen and spread, the maltsters have also risen but not as much – it’s always a trade-off when doing anything else with spelt (unless I use 2 ovens) as its much quicker to prove. Fortunately they get a good bit of spring in the oven. Next up, it’s onto the transfer board, slashed and into the oven! 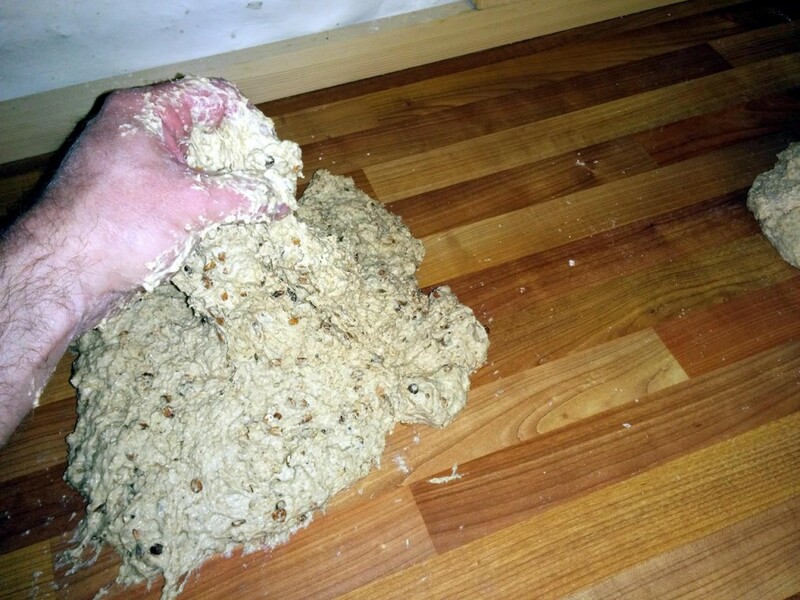 Couche to transfer board – this is a piece of 3mm plywood shaped to fit just inside the guide rails in my oven, so I can use it as a full-width peel to load bread into (and out of) the oven. This is the oven (with one bulb broken!) Note three shelves, each is a 10mm thick steel plate that fits into the guide slots. Each one weighs nearly 17Kg. the oven is heated up to 250C. Once the door is closed, a little button on the front panel opens the water solenoid which jets a spray of water onto the back panel which fills the oven with hot steam. And there we are. Low-impact sourdough baking. Minimal kneading, let all the hard work happen overnight and it only takes up a few moments in the evening and morning and it fits in well with the rest of the days activity. The last thing now is putting them in bags, sticking the label on and taking them up to the shop! This lot were in the shop by 9:30 and sold-out by lunchtime. Must make more! 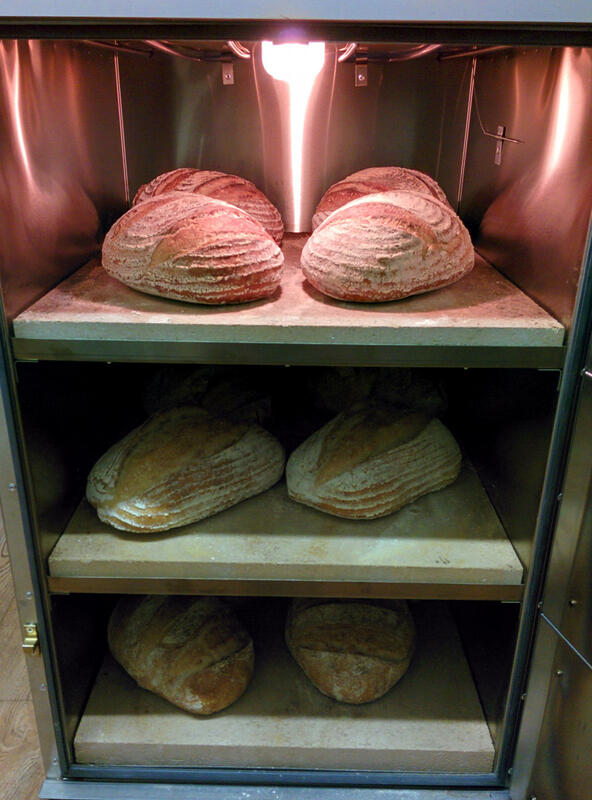 Sourdough is the “King of Breads” (according to some), however it’s the daily bread here in the Moorbakes kitchen. I did a post last year about how I make it, however since then a few things have changed, so here’s an update with pictures and wordes. Firstly what is sourdough bread? Simply put, its bread made without commercial yeasts. It relies on natural yeasts present on every grain of wheat (spelt, rye, etc.) which have been fed and watered and kept alive for use in bread. This goes by various names – The “mother”, or “starter”, “levain”, and so on. 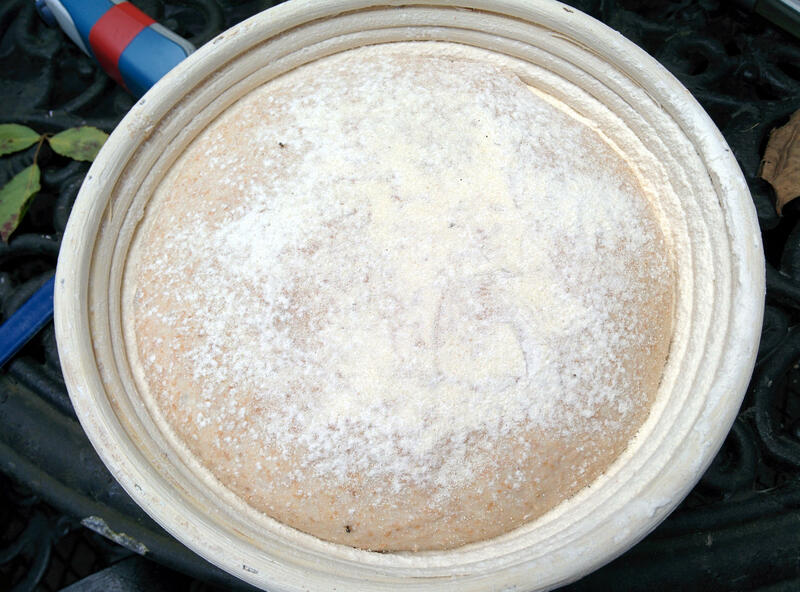 They’re all the same thing – active natural yeasts working alongside lactic acid bacteria to ferment the bread and give it a mild acidic tang. Some people keep their starters at room temperature – this is fine, but at room temperatures, the yeasts and bacteria will be working very fast – so-much so, that the culture will need feeding daily, and that means feeding it, then throwing away the excess… This Scottish baker doesn’t like the sound of that, so I keep mine in the fridge. It still works, just slower. Here we are at the start. It’s about 9pm and I’m making 2 different types of bread for tomorrow. 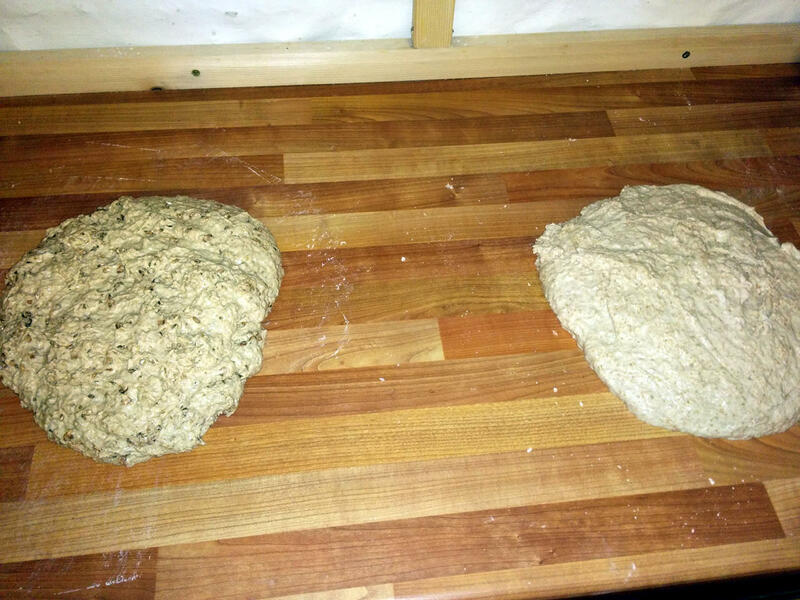 On the left here is the makings of my honey spelt and on the right is “Maltster”. This is a granary style bread. 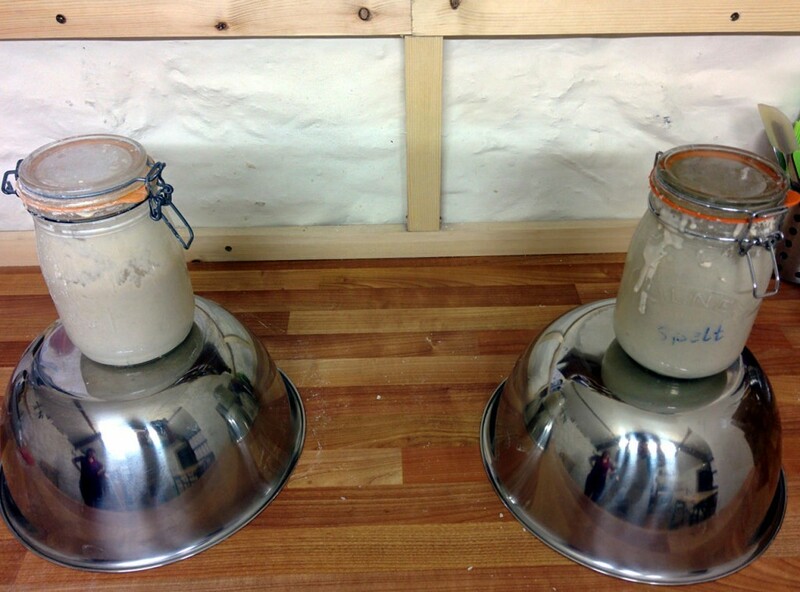 I keep separate spelt and wheat starters and the jars are in-front of the bowls. Because I have enough starter in the jars I’m going to use it directly from the jars which have just come out of the fridge. I’ve weighed out the flours (the maltster is Shipton Mills three malts and seeds (the light version) and the spelt is a 30/70 mix of wholegrain and white spelt. Salt is added too and its given a mix just to disperse the salt. Starters added into the bowls. 330g starter in each one. I’ve now added water and honey into the spelt mix and just water into the maltster. 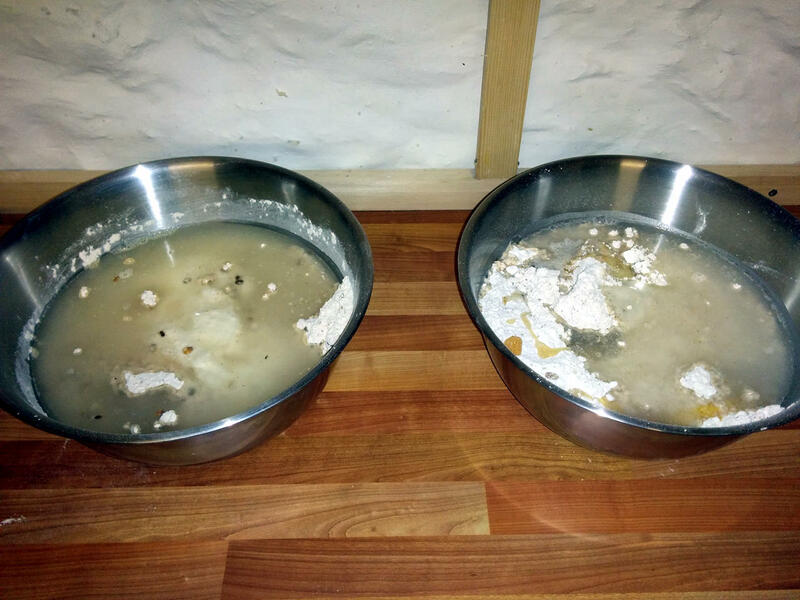 The next step is to mix the dough in the bowls – nothing special here, use one hand as my mixer and the other to turn the bowl – when all the water is incorporated into the flour, tip it out onto the bench and (literally) push it about a bit to make sure its mixed. This isn’t kneading, just mixing. This is the maltster mixed into a sticky/shaggy lump. You can just about see the spelt is the same to the right. At this point, we do some magic. 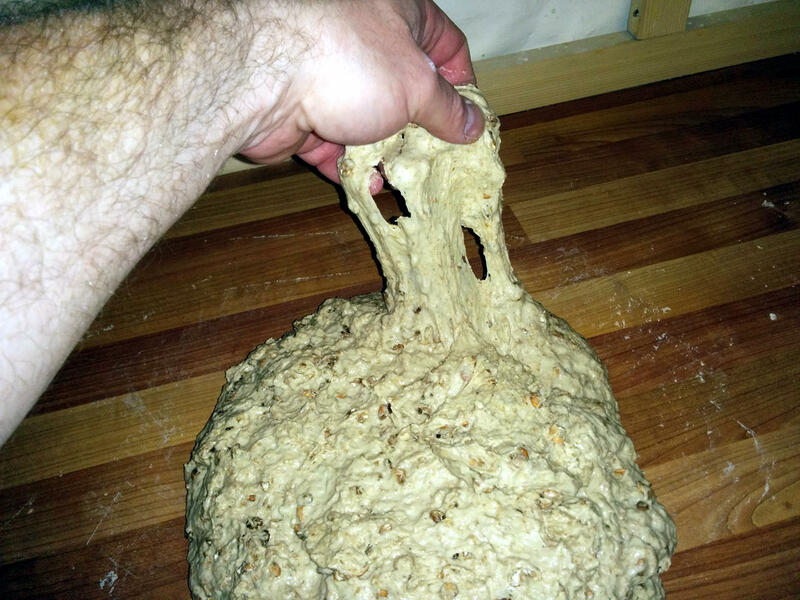 Well, no, not really… But after doing this for a few years and occasionally being distracted, as well as reading up on no-knead breads and so-on, what I do now is just cover them and leave them alone for half an hour. This may be autolyzing, but some will say that a “true” autolyze won’t have salt (or even yeast) in it. 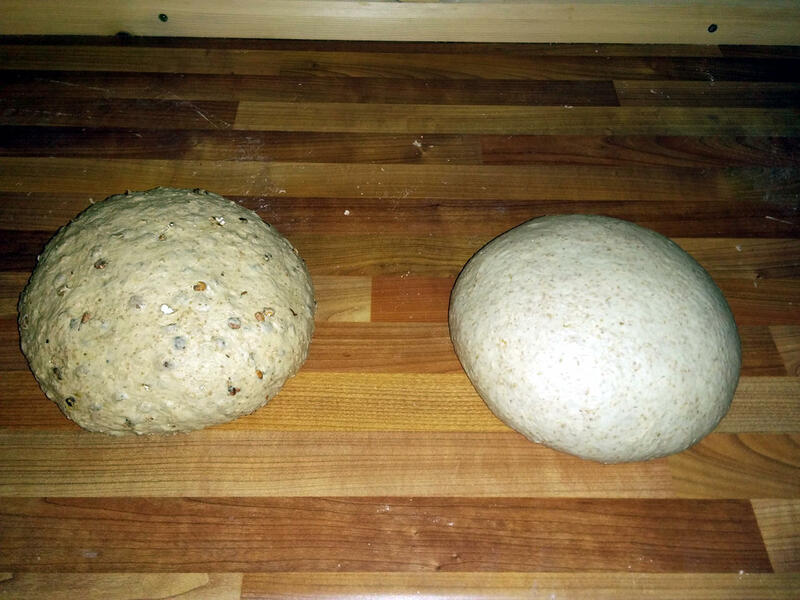 Whatever – all I know is that after half an hour’s wait, the dough will be very different and even the maltster which has a lot of wholemeal in it will pass a “window pane test”. 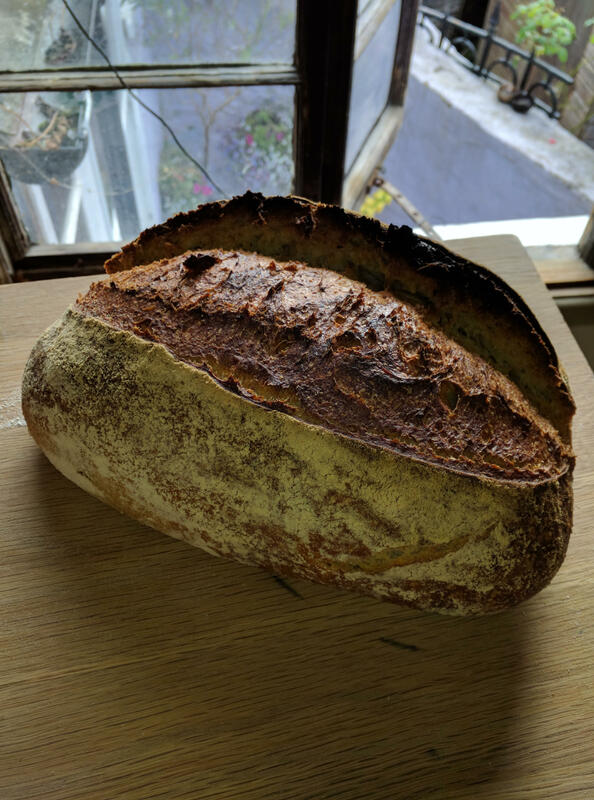 Quite hard to try to demonstrate a window pane test with one hand… But compare that with the photo above – it’s smooth and stretchy and I’ve not kneaded it at all. 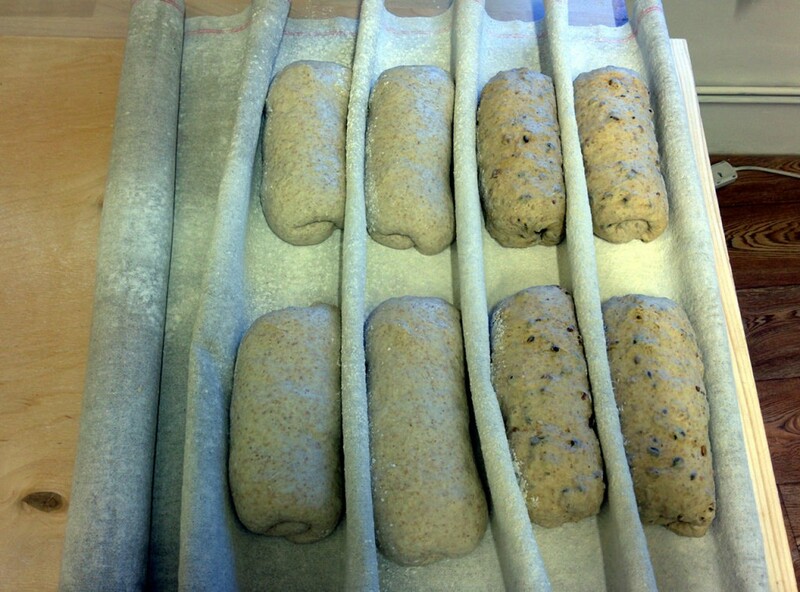 At this point, I have kneaded the doughs. But lets not go overboard. I literally did 3-4 rock and roll kneads. It took me 30 seconds per lump of dough. You can do stretch and folds if you like, but standing over it, kneading and kneading and kneading is not what I’ve done here. Into the fermentation tubs for an overnight snooze. (I’d use the metal bowls, but I know that they’re not quit big enough for this quantity of dough). I did check the temperature in-case anyone wants to know – it was 24C. 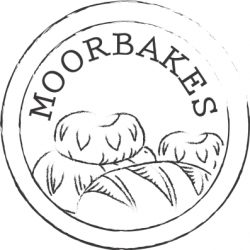 This is the moorbakes “bakehouse”. Well, the workbench. The ovens are behind me… The splashback will be fitted soon! so off to bed now and up at about 6:45am tomorrow morning, ready for part 2 when we get them ready for the oven and Bake! 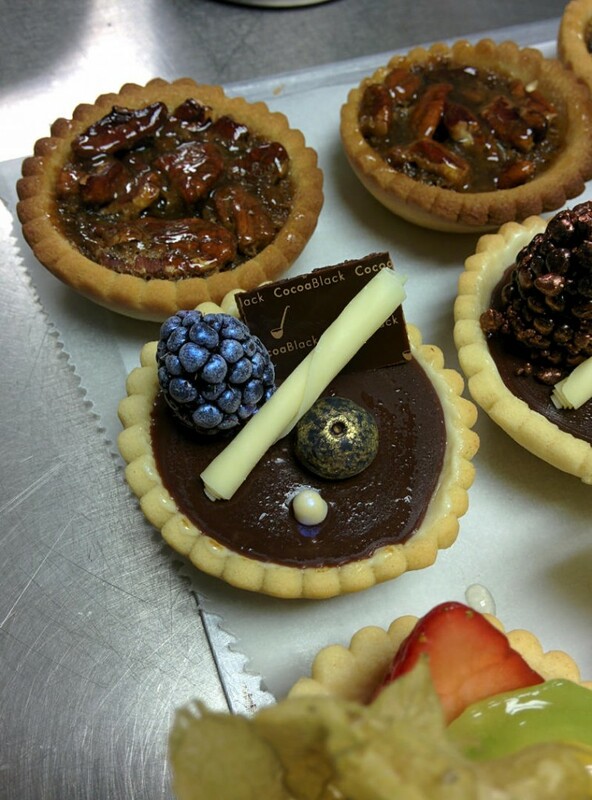 The Pastry Masterchef course is an intensive and challenging two days aimed at chefs, students, business owners and the home baking enthusiasts who wish to gain the latest pastry skills and techniques. Intensive and challenging it’s not wrong there. 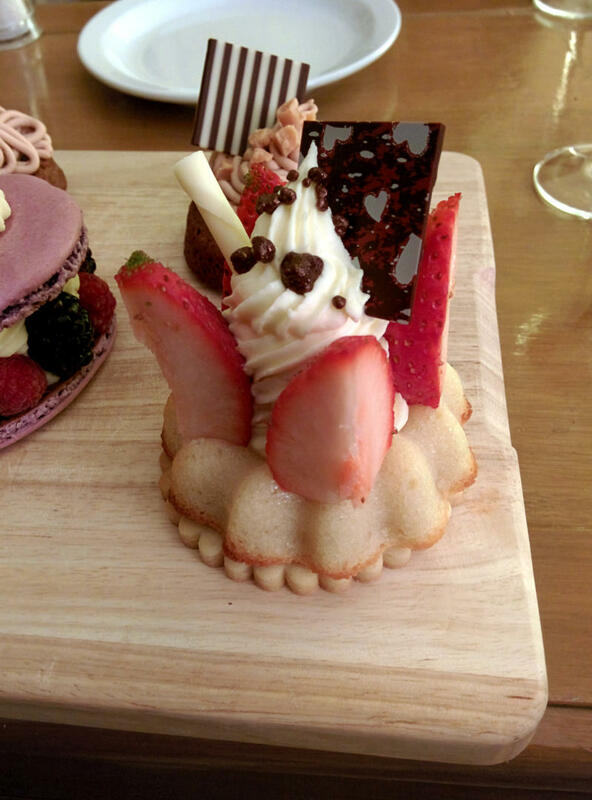 It was two days of non-stop pastry, entremets, chocolate and who knows what else I did which is still lurking at the back of my head waiting to swim to the surface. If you do this course, you need to go in with an open mind, open ears, open eyes, a thirst for knowledge and the ability to just soak up absolutely everything that you do in those two days. Ruth is a fantastic teacher – demonstrating techniques, then showing me how to copy (which I did, but practice makes perfect!) She made the most elaborate little (and big!) cakes look simple – breaking everything down into manageable steps – not always in the order you build the finished cake though, but planning is everything. Ruths fantastic staff (Zoe and Rachel), had measured out all the ingredients ready to use – which is essential when you have so much to cover, although I did have to weigh a few things – dividing a jelly between 2 cake rings equally for example. I made almost everything listed on the course page, although we did have some last minute substitutions – e.g. using a raspberry jelly rather than plum, so again, keep an open mind and prepare to be flexible. Ruth also made some changes for some of the macaroons I was taking home – so I could give them to my mother in-law who’s wheat and milk intolerant (we made a marshmallow filling rather than a butter cream type filling for example) so if going on the course, expect a little flexibility – all for the better I reckon. And on the taking-home front – I strongly recommend making sure you have an empty freezer drawer or 2, or lots of friends to share – I guarantee the last one won’t be a problem! A small selection put together for Sundays afternoon tea with my in-laws. 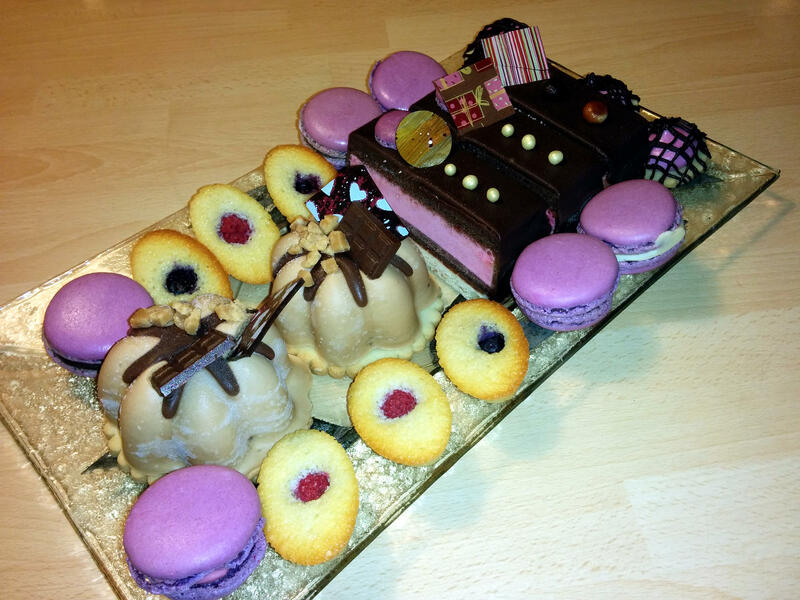 Macaroons, friands, chocolate and raspberry mousse slices, afternoon teacakes lurking round the back and caramel mousses. 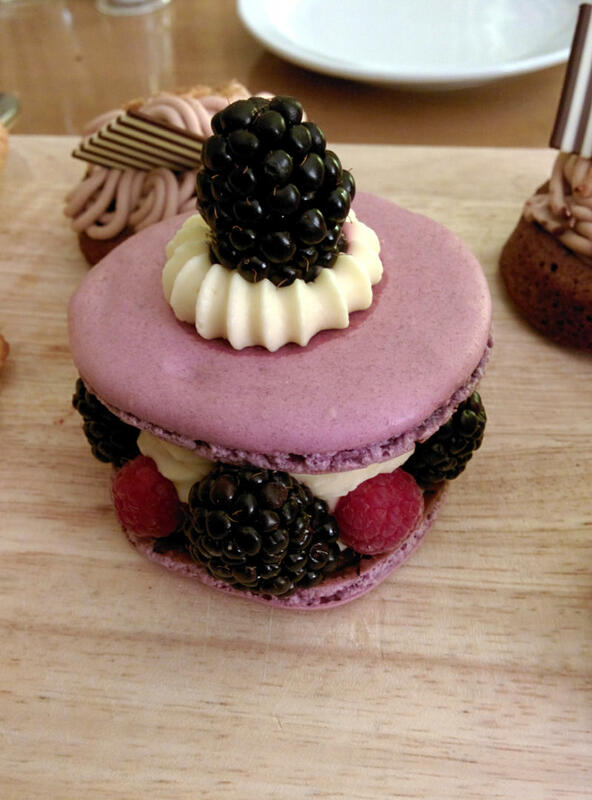 Who doesn’t like large macaroons? 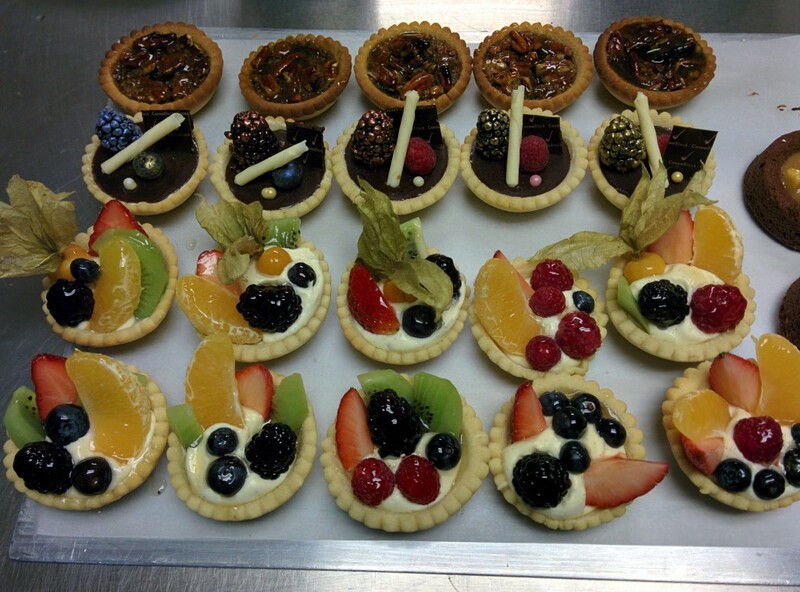 Filled with fruit – part of your five a day! More of your five a day – this time on a base made with a shortbread biscuit and friand. I made some of the chocolate plaques too (the heart ones) which involved tempering the chocolate first and while chocolate work was only a tiny part of the class it was still good to pick up some hints and tips about tempering. 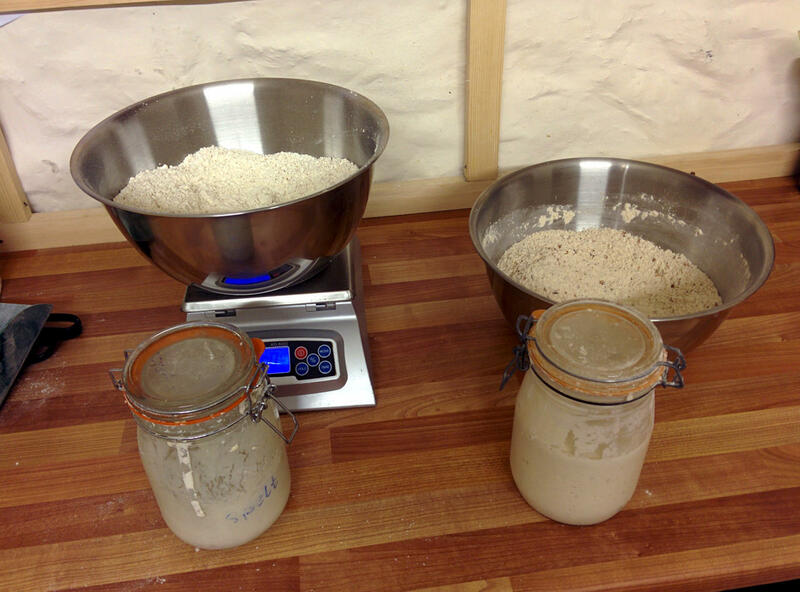 I took some of my sourdough starter to Peebles with me, and why not! The mats here are Silpain mats which were obtained from Cocoa Black. 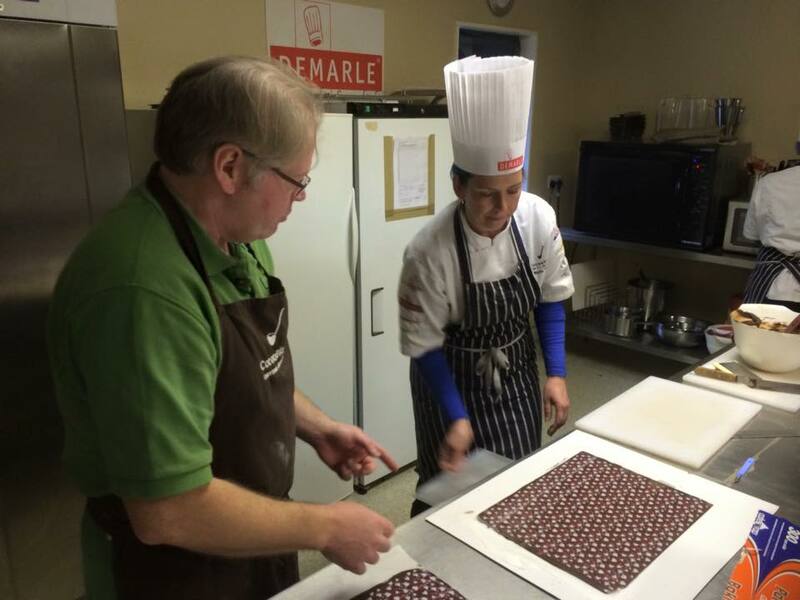 They’re a non-stick perforated silicone mat which holds a lump of dough perfectly on the grids on the oven allowing the heat to circulate evenly. 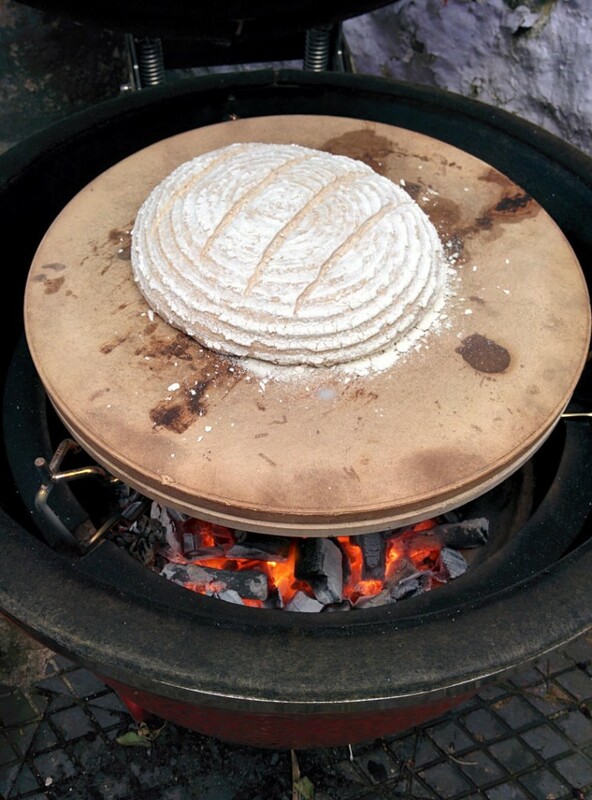 Seems to help give the bread a good bit of oven spring, despite the oven not being able to hold much steam. The bread tasted just fine! So what next for Moorbakes? Well one thing for certain, more (and more!) cakes, entrements and fruit tarts will be made to compliment the bread and cakes we already make. Exciting times are ahead!